Canal holidays are great for dogs: lots of walks along the towpath; people and other dogs to meet; and their owners where they can be seen and organised. And of course no pet passport is needed, and they can get here in their own car. Altogether much better than kennels. The first pet is free. Any more cost £25 each per week or part week. Your dog's usual basket may be too big to fit on the boat without being in the way, but if you bring its usual bedding it will be quite happy. Please bring some covers for our seating if your dog is used to going on seats or beds. Some dogs come with cages. There's usually room for these in the saloon, though a big cage will make it impossible to put the table up. Please ask for details of particular boats.There are some bags on the boat to clean up mess from the towpath, but please bring some of your own as well. Locals really appreciate dog owners who clear up. When working locks, it is essential to have at least one person concentrating on the boat, and one person concentrating on the lock. This means that if you have a crew of two, neither of you can also concentrate on your dog. You know your dog, so you can work out the best strategy. If your dog will not be happy wandering about on its own, or tends to get under people's feet, then either shut it in the boat, or moor it up to a convenient point on the lockside. 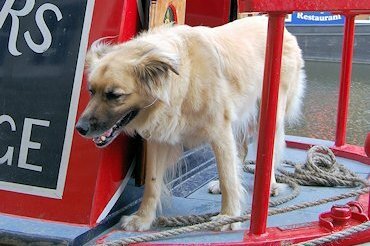 When dogs are shut in the boat for locks and so on, they tend to scratch the doors or windows trying to attract attention or escape, particularly if they are a bit frightened. 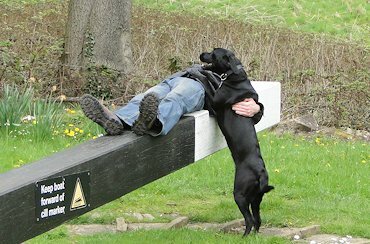 Please see Gange's advice opposite: your dog might be happier on the lockside. If your dog tends to shed hair, it will stick to our carpets. Handy tip to clean it up: use an old trainer to wipe the hair into clumps that you can sweep up. The towpath provides a continuous traffic-free walking ground for your dog (though bear in mind that road bridges are fairly frequent, which lead very suddenly into the real world of cars). On many parts of our local waterways, you have easy access to the moors. This open land will generally be 'access land'. Your dog can enjoy such areas off its lead, except between 31 March and 31 July and at all times near livestock (generally sheep), when it must be kept on a lead no longer than 2m. There might be additional local restrictions - look out for notices by gates and stiles. Always keep your dog away from livestock and birds - chasing ducks may be fun for the dog, but it isn't for the ducks! Please put hamster cages where they can't chew right through the curtains. We say this from painful experience! There's room in the front cockpit for a cage - we can provide measurements on request. Cats can walk along the gunwales, and get on and off the boat much better than dogs (though they don't swim well). Cats really are apt to wander off and not return, so though they are fairly common on houseboats, it's quite risky to bring your cat on holiday unless it stays in a cage. There's usually room for a fair-sized cage in the saloon. Please ask for details of your particular boat. 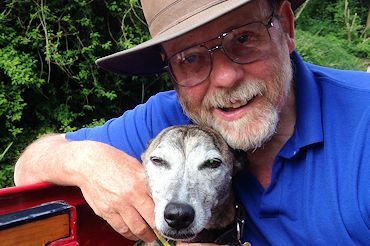 "I love boating: lots of walks on the towpath, people and other dogs to meet. When you're getting on a bit, like me, make sure your crew moor in sensible places where you can get off without too much scrambling. The back end of the boat is much easier to get on and off. They'd do well to watch out in case you fall in, so they can fish you out. I don't really like going up and down in locks. Sometimes I let them shut me inside, but generally I prefer to be on the lockside with people. I like meeting other dogs, and the towpath is great for that. But if you didn't like other dogs, you'd need to be careful where you got off the boat. I don't like tunnels, so they hold me and then I'm all right. "We had some great walks. 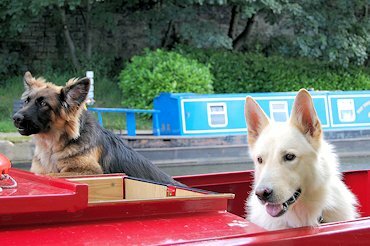 "I am still a puppy but the canal holiday was the most exciting week of my life! I loved watching the world go by from the barge (although on the third day Mummy and Daddy got quite worried all because I swam over to say hello to some other dogs on the towpath!). I am quite a nosy dog so I didn't like going down in the locks very much because I couldn't see - if I sat on Mummy's lap it was OK though. I liked all the dog friendly pubs we went to - it was nice to be able to go out in the evenings. I was so tired when we got home that I slept for a whole day!